i3 comes with i3bar by default, a simple bar that is sufficient for most users. In case you are unhappy with it, this document explains how to use a different, external workspace bar. Note that we do not provide support for external programs. The internal workspace bar of i3 is meant to be a reasonable default so that you can use i3 without having too much hassle when setting it up. It is quite simple and intended to stay this way. You typically want to see the same workspace bar on every workspace on a specific screen. Also, you don’t want to place the workspace bar somewhere in your layout by hand. This is where dock mode comes in: When a program sets the appropriate hint (_NET_WM_WINDOW_TYPE_DOCK), it will be managed in dock mode by i3. That means it will be placed at the bottom or top of the screen (while other edges of the screen are possible in the NetWM standard, this is not yet implemented in i3), it will not overlap any other window and it will be on every workspace for the specific screen it was placed on initially. In the context of using an external workspace bar, the IPC interface needs to provide the bar program with the current workspaces and output (as in VGA-1, LVDS-1, …) configuration. In the other direction, the program has to be able to switch to specific workspaces. By default, the IPC interface is enabled and you can get the path to the socket by calling i3 --get-socketpath. To learn more about the protocol which is used for IPC, see docs/ipc. i3 implements the RandR API and can handle changing outputs quite well. So, an external workspace bar implementation needs to make sure that when you change the resolution of any of your screens (or enable/disable an output), the bars will be adjusted properly. The most common reason to use an external workspace bar is to integrate system information such as what i3status or conky provide into the workspace bar. So, we have i3status or a similar program, which only provides text output (formatted in some way). To display this text nicely on the screen, there are programs such as dzen2, xmobar and similar. We will stick to dzen2 from here on. 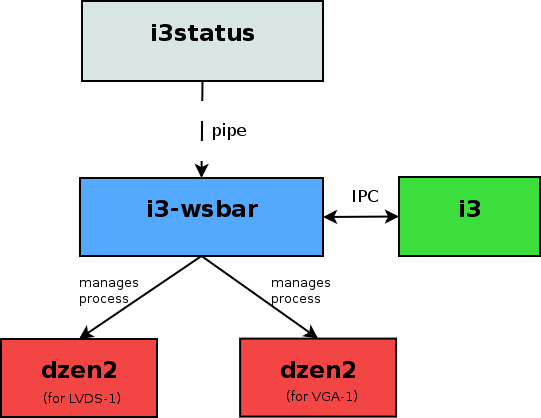 So, we have the output of i3status, which needs to go into dzen2 somehow. But we also want to display the list of workspaces. i3-wsbar takes input on stdin, combines it with a formatted workspace list and pipes it to dzen2. Please note that i3-wsbar does not print its output to stdout. Instead, it launches the dzen2 instances on its own. This is necessary to handle changes in the available outputs (to place a new dzen2 on a new screen for example). i3-wsbar -c "dzen2 -x %x -dock"
The %x in the command name will be replaced by the X position of the output for which this workspace bar is running. i3 will automatically place the workspace bar on the correct output when dzen2 is started in dock mode. The bar which you will see should look exactly like the internal bar of i3. i3status | i3-wsbar -c "dzen2 -x %x -dock"